Pi-er Jiban (life of Pi) Yann Martel started the novel and he is first person here. He moved himself from Canada to Pondicherry in India, the purpose is to write a ageless novel. The reasons for coming to India, stay at low cost here. At least compared to Canada! After six months hard work, the author made his novel. After reading the novel he realized, there is an unknown attraction by that a story becomes alive, becomes credible. That's not in his story. Understand, there is nothing in his novel. Then he packed the novel and posted it to a legendary address in Siberia. When he tried to forget this sorrow then one day he met an old man in a restaurant. He is a writer when the old men heard this he came forward with enthusiasm and told "I have a story, it is such a story, if you hear it your faith to God will return!" After that Yann Martel rush in search of the story, Canada tour and finally find out the hero of the story, heard the whole story in his own voice. So much detail in the book, there is so much extraordinaryity, after reading the book, you will be forced to acknowledge it that its much better! 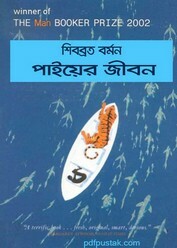 Collect this translated book- 'Pi-er Jiban' in pdf. Quality- not bad, no watermark.